Minpins are stylish and referred to as the "King of the Toys." They are Big Dogs in a little package. They are full of confidence as they prance around to show they are special. They don't all have the same personality naturally, but they have certain characteristics that appear in every minpin. They are spirited and loving. They don't realize they are a small breed, as they seem fearless. Originally they were classified as terriers by AKC, and they still carry a terrier-type tenacity. They are excellent watch dogs as they are always alert. From the German Schnauzers Pinscher Club came the smooth coated minpin. The standard height is 10" to 12 1/2 " tall. Being smooth coated they are easy to take care of. Their body should be well balanced. Their weight should be balanced with their size, normally under 10 pounds. Colors: Solid clear red, stag red, black/rust, or (tan) and chocolate/rust (or tan). The colors blue and fawn are not permitted in the show ring. There are a few excellent breeders, exhibitors trying to work with the blues and get them reinstated into the show world. The dilutes are prone to skin and coat problems, called Color Dilution Alopecia, also seen in the Blue and Fawn Doberman Pinschers. When owning a blue or fawn minpin you need to be aware of the possibility that skin or coat problems may occur. This has been studied for years in the doberman pinschers. If you are considering owning a blue or fawn, take the time to learn all you can regarding these colors. I personally believe if you are careful and only use good coated blues and fawns in a breeding program you can over come the skin problems. I think the blues are a beautiful color & hope to see them reinstated one day and accepted by all minpin breeders exhibitors. I am the proud owner and breeder of healthy, beautiful "blues". Minpins are known for their beautiful hackney gait, a walking horse-like gait. They prance around appearing to say " Look at me, I am a minpin". I own both Tn. Walkers and Miniature Pinschers, they both walk with "style". 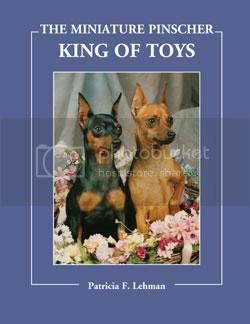 The Miniature Pinscher: King of Toys. This is a great book on minpins. check out pages 144 & 145 to see several photos of my minpinKids. Thanks for adding them to your book Patricia Lehman!